“Canonet” is a name given to several 35mm rangefinder cameras made by Canon from 1960 until 1972. These compact little cameras are known for their sophistication and performance. All of them are equipped with a large-aperture (f/1.7 to f/2.8, varying by model) fixed focal lens, solid construction, and bright viewfinders. Stephen Gandy says, “Though probably the best selling fast lensed compact 35 RF, today the G-III 17 mostly goes un-noticed and unwanted at camera shows. Yet, the G-III 17 has many features which current production cameras in its price range don’t have: a sharp fast 40/1.7 lens, user selectable rangefinder focusing, and flash sync at all speeds. It is one of the nicest of the 70’s compact Rangefinder genre. ” The G-III QL 17 belongs to an elite group of compact 35 Rangefinders with faster than f/2 lenses, combined with automatic exposure with manual over-ride. It competes with the Leica CL, at far less cost. In size the G-III 17 is comparable to the Leica CL, but of course without interchangeable lenses. Its specifications are pretty nifty for its genre. So nifty in fact, the G-III became a best seller with over 1.2 MILLION SOLD from 1972 to 1982 per the Canon web site. This probably makes the G-III the best selling 35mm rangefinder with built in meter OF ALL TIME. The Canon web site goes on to explain that the the “G” stood for “grade up” in quality improvement, and the “III” for the third of the Canonet series. My Impressions I’ve always liked compact rangefinder cameras – they’re not much bigger than today’s point-and-shoot cameras, they offer more control to the photographer, and they have fast lenses, allowing them to shoot in light where a modern point-and-shoot camera would be forced to use flash. With manual focus, no motor advance and quiet shutter release, they’re perfect for street shooting. The Canonet has a great feel to it – the construction is solid, the controls are where they should be, and the camera is not too big to be cumbersome. The viewfinder is very bright, and rangefinder camera viewfinders show more than what ends up on film, so you can compose a photograph with cues from what’s outside the picture frame. I own a Canonet QL 17 GIII – the last model Canonet made, and one of the more common cameras on the used/junk camera market. It has shutter-priority exposure- you pick the shutter speed on a ring on the lens and the camera displays the chosen aperture in the display. The camera does not meter in manual mode, but if you want to shoot manual, just meter in auto, then change the settings on the lens to whatever you choose. The lens is extrordinarily sharp. I was pleasantly surprised by my first few test rolls. It’s a little softer when shooting wide open, but with 400 speed film you can keep it around f/5.6 or f/8 in most any light situation to hit the lens’ sweet spot. The shutter is quiet, the film advance unobtrusive, and the appearance of the camera is very non-threatening, making it wonderful for street candids. Some people get intimidated by a big-lenses SLR with motor advance, but this camera is quite disarming. My whiz-bang SLR camera is has a list of features as long as my arm, but SLRs are hampered by their shutters. If you put a flash on an SLR, you need to shoot at the flash sync speed, which is typically a relatively slow speed like 1/60th or 1/90th of a second. To shoot with flash at a higher speed requires expensive E-TTL flash units and high-speed sync, which uses a series of smaller, lower-powered flashes. The Canonet and other rangefinders have a leaf shutter and can sync with a flash at any speed up to its maximum shutter speed of 1/500th. This flexibility makes shooting with fill-flash in daylight possible with a $5 manual flash unit. I bought a Canolite D flash. 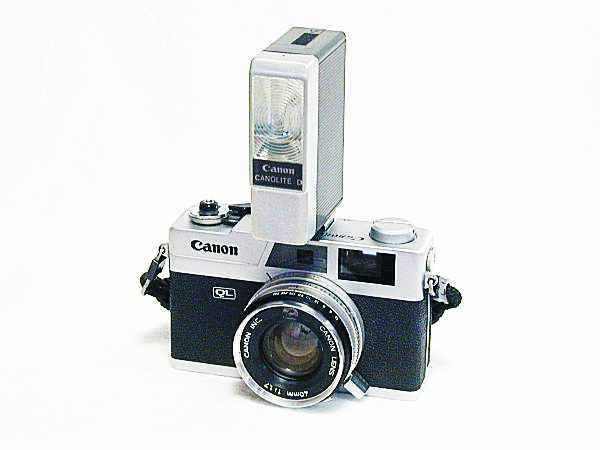 It’s dedicated to the Canonet; put the flash on the camera, turn it on, and everything is set automatically. The flash sits atop the camera, which lessens the chance of the dreaded “red-eye” effect when shooting with a flash. If you shoot with a non-dedicated flash, there’s a neat feature – turn the aperture ring to the guide number of the flash, and the camera will automatically adjust the aperture based on distance reported on the coupled rangefinder. 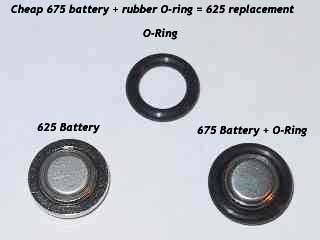 Remove the ring surrounding the shutter release with pliers. I used a piece of rubber innertube to get a better grip and to protect the ring. Remove the 3 screws around the camera on the sides and back. Open the camera and remove the reqind crank by blocking the portion that goes into the film roll and turning the crank. Tucked in underneath the film motion sensor (The little red and white-striped flag) is the meter adjustment. It looks like a little pointer on the back side of the meter. Gently nudge the pointer to change the meter reading. I used a camera with a known good meter, set both cameras to ASA 100, 1/100th second, and matched the meters in daylight, a bright room, and in the shade. Shutter Copal with B, 1/4 sec. to 1/500 sec., X-sync. Built-in self-timer. Hot shoe and German socket. Viewfinder Coincidence rangefinder integrated with reversed Galilean viewfinder. Automatic parallax correction with projected frames and marked finder. 0.6x magnification. On the right within the image area are the aperture scale, meter needle, overexposure and underexposure warnings. EE CdS cell for shutter speed-priority EE. Metering range of EV 3.5 – 17 (at ISO 100). Film speed range of ISO 25 – 800. Manual exposure enabled by disabling AUTO. Power Source One 1.3 V H-D mercury cell. Battery check provided with a lamp. Film Loading & Advance After opening camera back, align film leader at mark then advance to first frame with Quick Loading (QL) system. Advances with camera-top lever’s single stroke. Partial strokes not enabled. Film transport confirmation window provided.